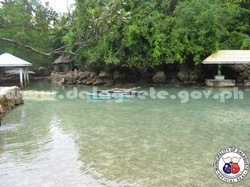 The Obong Spring is a fresh water spring which emanates near the beach. Because of steady outpour of water, a pool of freshwater meets the sea especially when the tide is high and the water become brackish. So, that’s the explanation behind such mystery. 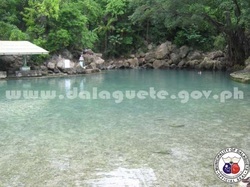 The spring is located in Dalaguete, Cebu. 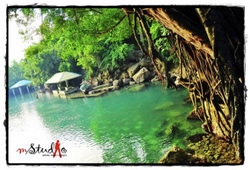 From Cebu City, you still have to pass scenic towns that is worthy of visit like Argao, Carcar, San Fernando, Naga, Minglanilla and Talisay. 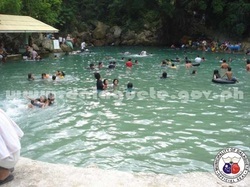 Obong Spring rests in the southernmost or the last barangay before reaching Alcoy. Obong Spring signboard can be seen before the sign, Alcoy Ahead. 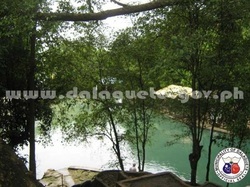 The spring is in the humble municipality of Dalaguete, where Dalakit trees are found. One local legend narrates how the town got its name. Accordingly, Spaniard soldiers passed the place where a woman took her bath. The visitors asked the name of the place. The woman got the wrong idea, thinking they were asking the name of the tree where Spaniards were standing, she answered “Dalakit” and eventually recorded as “Dalaguete. 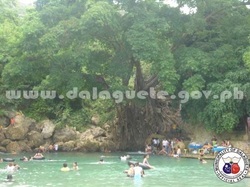 Amazing enough, the big and almost a century-old dalakit tree is still remained standing near the Obong Spring. Other small springs gush forth from other dalakit trees. 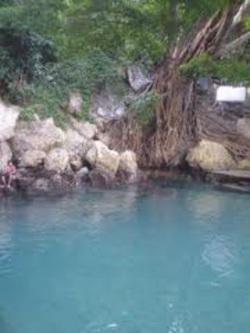 Its waters are naturally cold and refreshing. It is one of the best getaways during summer where the heat of the sun is excruciating. 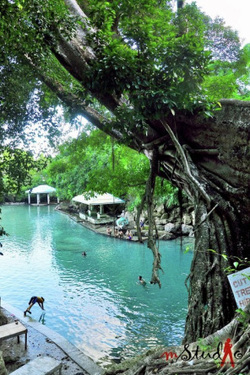 For Dalaguete, Obong Spring is such a pride. The spot remained unspoiled, though progress is visible. 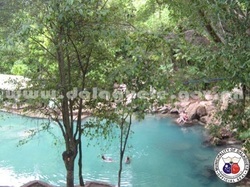 It has been included in the list of Suroy-Suroy as one of the must-experience tourist destination. 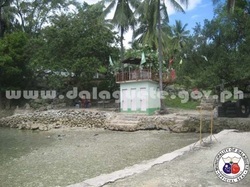 The locals named the place as “Tubigan”. 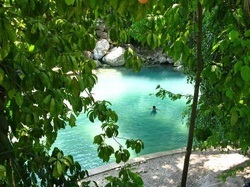 Unlike other resorts where the spring waters are accumulated and turned into a pool, this one is a natural pool. Dressing rooms are erected and lifeguards are on strict vigilance. Cottages are also available. First timers cannot resist the cold offering and surely found in no time splashing around or jumping in huge rocks like an amateur divers. Swimming in this spring is like immersing in your bathtub full of ice cubes. So better go there when the climate is hot or else, you will experience chilling and freezing all the time. 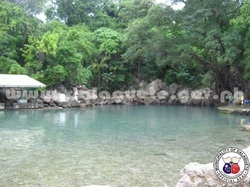 With only 10 pesos as the entrance fee, you will be one with nature in a very relaxing way. Not only the locals but the foreign tourists are fascinated by its offering. But not just diving and swimming are the activities to be done in there. 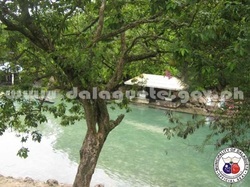 Picnics by families, sight-seeing, photo-taking and simple relaxation is viable in the place. If relaxation is what you want, avoid going there in weekends for it is usually overcrowded. No relaxation will take place if such will happen. 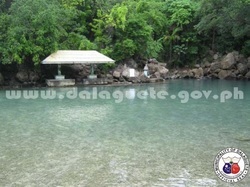 In the shores of Dalaguete, a history is worth reminiscing. 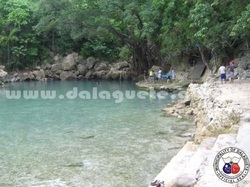 Once, Dalaguete is under attacks of the marauders. These surprise attacks left the commoners defenseless and in no way to fight for the protection of their families and other valuable possessions like houses, livestock etc. Great thanks to Fr. Julian Belmejo, whose abilities were able to construct a heavy defense system by building “Baluartes” in neighboring towns including of course, Dalaguete. The warning system was proven effective after the defeat of the raiders on 1813. Since then, Dalaguete and other towns like Oslob, Santander, Boljoon and Sumilon were free from ruthless attacks of the marauders. 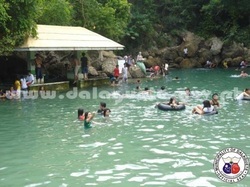 Now, tourists attacked the place because of its natural tourist spot that only Cebu especially in Dalaguete can offer. It will remain a tourist spot for the generations to come.